THE UNITED NATIONS celebrates 2019 as the International Year of the Periodic Table. This familiar array is more than a collection of chemical elements. As described in Science, February 1, 2019, the Periodic Table is itself a paradigm of science. Here are tidbits gleaned from themes discussed in this special issue of Science. 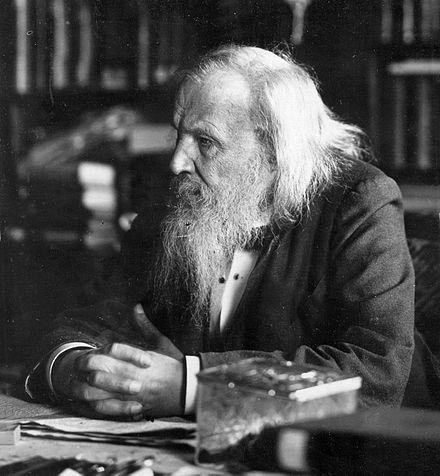 Dmitri Ivanovich Mendeleev, 1834–1907, Russian scientist, professor of chemistry at St. Petersburg University. Image from 1897. In February 1869, Russian chemist Dmitri Mendeleev published his classification of all the known elements, organized by atomic weights. He also included gaps in his array for the placement of undiscovered elements. 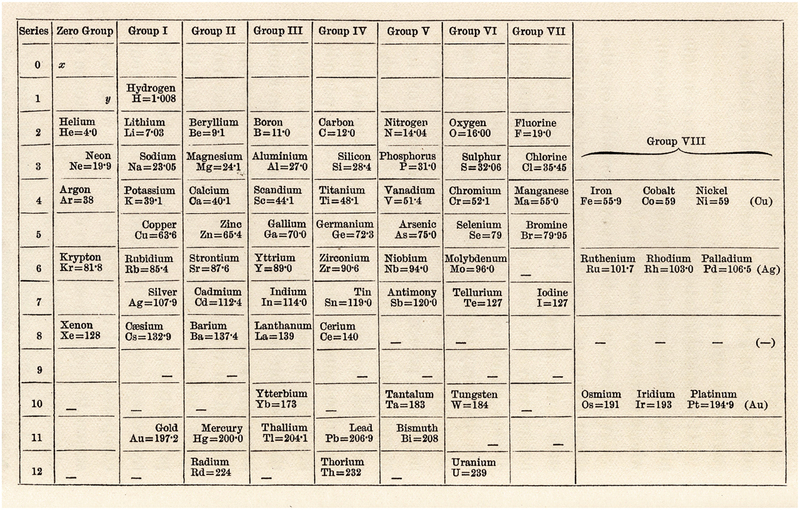 An Attempt at a System of Elements, Based on their Atomic Weight and Chemical Affinity, D. Mendeleev, February 1869. Not long after its original publication, Mendeleev reorientated his array, mirrored and rotated 90 degrees, to the one we know today. One of the 1869 entries, the rare earth didydium, Di = 95, proved spurious. Discovered in 1841, didymium was isolated in 1885 into two new elements, praseodymium, Pr = 59, and neodymium, Nd = 60. Others, including those heavier than uranium, U = 239, have expanded the Periodic Table to its current form. It’s anything but fixed, though. ”The Quest for Superheavies,”, by Sam Kean, describes work in Dubna, Russia, resuming this spring in a hunt for these transuranium elements. 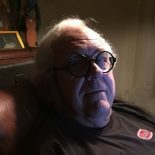 At current count, the International Union of Pure and Applied Chemistry identifies 11 elements having atomic weights heavier than that of naturally appearing uranium. Their names tell stories: Mendelevium Md honors Dmitri Mendeleev; curium Cm, Pierre and Marie Curie; einsteinium Es, Albert Einstein; and fermium Fm, Enrico Fermi. Origins of discovery are honored in americium Am, californium Cf, and Bk berkelium. These transuranium elements are all unstable, radioactive, and decay into other elements, some very rapidly indeed. Nihonium, Nh, with atomic number 113, has isotopes with half-lives measured in milliseconds. Even its most stable form, nihonium-286, loses half its radioactivity in about 10 seconds. Above, Mendeleev’s 1904 Periodic Table. 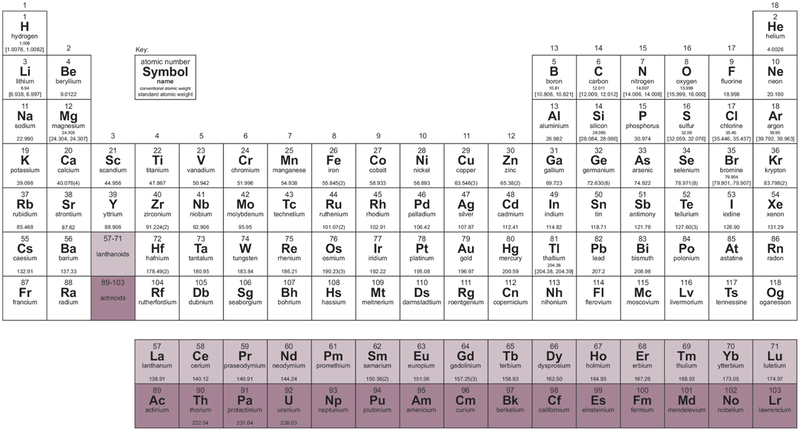 Below, the Periodic Table, as identified by the International Union of Pure and Applied Chemistry. Images from Science, February 1, 2019. “Ordering the Elements,” by Michael D. Gordin, offers evolution of the Periodic Table, from Mendeleev’s 1869 concept to the chart displayed in just about any science classroom in the world. The first day of high school chemistry, the teacher said, “In your book is the periodic table. Memorize it for tomorrow.” This is not how I learn, and I didn’t do well. Years later, I watched Jacob Bronowski explain how the table came to be, and how it left spaces for new knowledge. He put it in context and gave it life. As a chemistry major at UC Berkeley in the early ‘50s, I had the opportunity to take a course in nuclear chemistry from Dr. Seaborg, who was responsible for “discovering” many of the transuranium elements. Element 106 was finally named in his honor. I also had the opportunity to tour the UC Radiation Lab on the hill above the campus. At that time, they were still building the 2bev accelerator, which, at that time would be one of the most powerful particle accelerators of its day. To this day, I can’t look at a Periodic Table without hearing “The Element Song” in my head… thank you Tom Lehrer for getting me through that semester of high school chemistry. 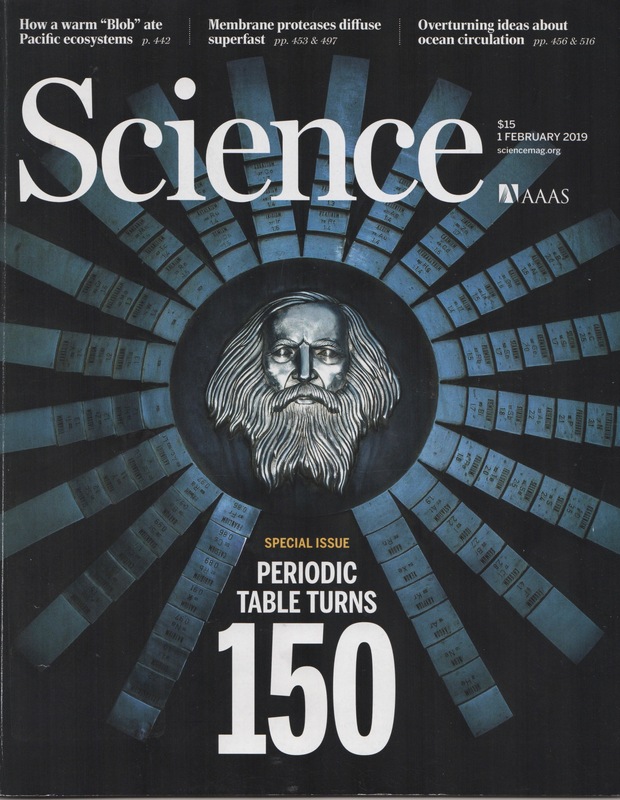 This entry was posted on February 22, 2019 by simanaitissays in Sci-Tech and tagged "Ordering the Elements" Michael D. Gordin AAAS Science, "Setting the Table" Philip Szuromi AAAS Science, "The Quest for the Heavies" Sam Kean AAAS Science, 150th birthday of Periodic Table, Dmitri Mendeleev.